Contemporary banks cannot be imagined without electronic services, which allow customers control their finances remotely. Bank Technique OJSC is one of such contemporary and innovative banks in the current market of financial services. Trying to meet demands and wishes of its customers, the bank offers them a variety of banking services. Putting these services into practice allows the bank to manage its assets efficiently, thus achieving a high payoff. The main goal of Bank Technique is to become the most technological bank in the country. The bank is planning to achieve this goal through an upward transition, such as reformation of business processes, optimization of expenses, improvement of infrastructure and efficiency in all structures of the bank, as well as taking active measures towards calling in troubled loans. The bank has already computerized most of its processes and is planning to make full transition into branchless customer service. Following the principle that only the level of technological development will be the main defining criterion for competitive ability in the banking sector, Bank Technique has made an evolutionary turn in its operations, introducing many innovations. All this received high acclaim from International Financial Institutions. As a result, the bank was awarded the status of the “Fastest Growing Bank in Azerbaijan 2013” by prestigious international analytical portal Global Banking & Finance Review. This award is well-known in international banking and finance circles and reflects the innovation, achievement, strategy and progressive changes taking places within the financial community. Earlier, Bank Technique was awarded national “UGUR” prize and has been recognized as the most dynamically growing bank in Azerbaijan in 2012. The current banking and customer services at Bank Technique mostly proceed from classical banking of the last century. However, Bank Technique especially ties its perspective development to innovative and progressive banking, which will enable its successful positioning and development in competitive environment. Using demands of the day as a guide, Bank Technique has successfully finished migration into a new computerized banking system FlexCube by Oracle Financial Services Software, which allows computerizing of almost all operations. It is remarkable that the project was completed in a very short period of time – only four months. The migration covered 33 branches and 10 departments of the bank. During the project 130 000 customer accounts with new IBAN codes were moved. Moreover, thanks to the effective upgrade of the processing center, the bank has introduced over 10 types of card services, such as “MobileBank”, “Internet Banking”, “SMS-notification”, “Card-to-Card” services, etc. The servicing network of the bank also underwent certain changes. 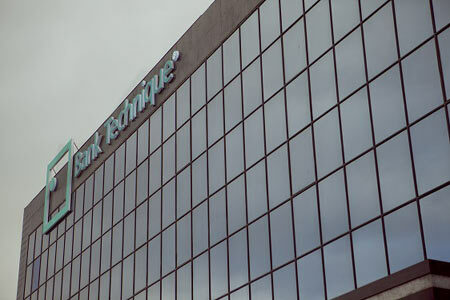 As a result of evaluation of all organizational subdivisions at Bank Technique, the management of the bank decided to shut down four branches, over 20 departments and subsidiaries for cost efficiency reasons. Currently, there are thirty three branches and eight divisions of the bank across the country. However, Bank Technique plans to open new branches in Azerbaijan, offering its customers high-quality products and services according to western standards. The first of such branches, “Yeni Hayat”, was opened in Azure Business Center after re-branding. Another new branch, “Mughan”, was opened in June in Nasimi district, Baku. The customers are offered hi-tech services, as well as a large variety of banking products. Following the strategy of upgrading the products and services, in 2013 Bank Technique produced a new line of deposits for individuals, such as Standard, Yigim (Collection), Unikal (Unique), Shans (Chance), Telebli (Withdrawable on demand), Ushag (Child) and Xeyriyyechi (Philanthropist) as well as the unique multi-currency deposit Multi-TEC. Depositors do not have to worry for their savings in foreign currency because of fluctuations of exchange rates. The advantage of Multi-TEC deposit is that you can combine several currencies (manat, dollar, euro, British pound sterling) in one account. At the same time, the depositors no longer have to exchange the currency. The bank also offers the possibility of withdrawing money in any currency. At the moment one of the main tasks of the bank is to launch remote banking, also targeted at retail market. The purpose of this innovation is to allow every customer of Bank Technique to take advantage of the services offered by the bank remotely, through internet, cell phones and other means. Notable steps towards this have been taken through online loan and online deposit services. In addition to this, through payment terminals of the bank, spread across its branches, notarial offices and traffic police departments, people can now easily pay online any fines. The bank has also launched the service of “Personal Cabinet”, through which Bank’s customers registered on the official web-site of the bank can make wire transfers through plastic cards, save their personal payment histories, remember their registration codes for utility and other services, control the balance of their bank accounts, send electronic requests for opening an account, order a loan or a plastic card, pay for a loan, etc. With new “Account payment” service of “Personal Cabinet”, the owners of Bank Technique payment cards will be able to fill their accounts at online.banktechnique.az. The service charge is 0.1% from made transaction, with minimal charge of 0.20 AZN. Having studied both the local and foreign markets, Bank Technique intends to adopt the best innovative systems and products, which can be currently in demand in Azerbaijan. Thus bank is actively adopting new practices. The bank has transformed into a modern financial structure, ready to offer its customers a wide range of banking services. Some of them are unique for the banking market of Azerbaijan. The great leap in development of technologies, globalization, the high levels of urbanization and many other factors have made the bank an integral part of our everyday lives. The goals, challenges and tasks of the bankers from 200 years ago cannot be compared to the volumes, challenges and responsibilities they have to undertake today. The classical banking of the 20th century does not correspond to the demands of the era of innovative technologies, when the developing market depends on modernization of services. And, the demand for such services grows by the day. Thus Bank Technique has become the first Azerbaijanian bank, which is constantly exploring new opportunities.